The leopard danio also known as Danio frankei. They are best kept in water parameters of PH level of 6.5 – 7.0. Temperatures of 19 – 24 Celsius / 66 – 75 Fahrenheit. They can grow up to 3 inches fully grown. 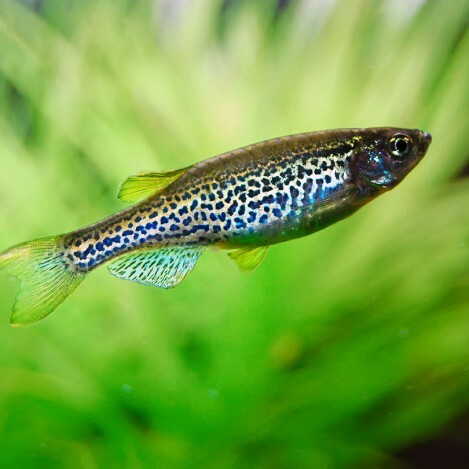 The leopard danio is just like the zebra danio, instead of the strips it has a sparkly brown, gold body. They are peaceful fish but can some times be a little nippy. Mixing with smaller community fish is fine, but we do say be very careful with mixing them with fish with long flowing fins. They like to be mixed in groups as they are a playful fish, so mixing in small groups is a good idea. They can take cooler temperatures so can go in a room temperature tank. They are very greedy fish so do make sure you feed them a good variety of foods as they will eat anything you put in the tank. They will eat any food you put in the tank. They do like a treat of frozen or live foods in there diet.